Nice cotton quilt that can be used in winter with blankets underneath and in summer as a light covering over sheets. Pattern is very attractive. The cotton fabric could be a bit softer but overall is high quality. Laura Ashley is known for her iconic patterns that are timeless and this is one of our best sellers. Adorn your bed with a whimsical floral print or switch to small geo print with this fully reversible three-piece quilt set from Laura Ashley. This all-cotton quilt set is soft and easy to care for. The set includes matching shams (One (1) Sham with Twin size) Quilt set is 100% cotton, prewashed for added softness. Quilt features a dark gray floral reverses to a minimial geo pattern. 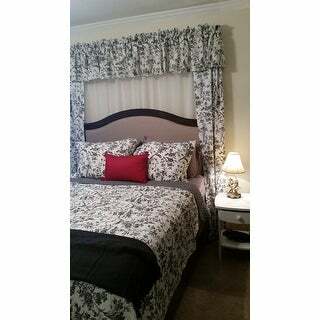 Layer with our Laura Ashley sheet sets and matching European Sham covers sold seperatly. The picture is deceiving because it looks gray and white. The description states that it is black and it is black and white. From a distance it appears dark gray and white. The reverse side is a black and white print. It is well made and a nice weight (thickness). Although I would have preferred gray and white, I feel it was a good deal. I have a pale blue bedroom with a black iron bed w/ black knobs on my furniture, this quilt looks "expensive" in the room. I happen to find sheets that match the quilt (lucky me) I have gotten so many compliments on the room, I was thrilled....looks very high end! I have purchased many quilts for Overstock and have never been disappointed. I do read all the reviews first and then go from there. I love this item, you can't go wrong with "Laura Ashley" products....LOVE IT! So, I had purchased another quilt set and was looking for a complimenting color/pattern. The black and white (it's definitely black and white, not gray and white) checkered/dot pattern on the back looks great with the other set. My husband and I have to have separate blankets and I thought a twin of this one would be good for me. As far as the color and pattern and the overall size of the quilt, it's perfect. However, it is a little stiff. I washed it before I used it and threw in extra fabric softeners to soften it up. The other quilt set I bought is very soft and cozy. This one was warm enough for me and the quilt fabric is soft, just less flexible blanket. I'm hoping after a few washes it'll be better. I do love how it looks on the bed, though and I will continue to use it. Love this set, and it is long and wide enough to cover the queen bed well. Love this quilt set.good quality as all Laura Ashley quilts are. nice fabric, runs very small barely covers to the bottom of my 12 inch temper mattress. it shrinks in the washer and dryer making it even smaller. It is true black and white. A disappointment for an Ashley product. it will do until I find one better. At beast not on my king size bed, It was beautiful and Good quality but I had to buy coordinating fabric and put a 6 inch border on three sides to fit my bed. I ordered king size and it is so small it barely covers the bed it goes down maybe 5 inches on the sides and it's rather thin. Black and slightly off white quilt. Love Laura Ashley quilts. They are not heavy quilts. This quilt isn't for cold weather. I have a blanket under the quilt. The floral pattern is dark and the white background is not that shocking bright white. I like the contrast. I love the dark pattern on the backside too, which is also along the trim. I have purchased similar style quilts from pricey department stores with the same quality but double the price. I would purchase another one if need be. It is good quality, not very heavy, which will be good for summer use. I have a Queen sized bed and hate having to deal with the bed skirts and tucking in sheets. So I ordered a King size and the sides drop perfectly. I purchased two kind size pillows which fit the shams. It is a perfect solution to this problem. It is reversible, but I like the lighter side one better. Floral pattern is much wider. Back appeared solid dark grey which I WAS looking for. It is actually black and white pattern. I had already bought two other quilts that the color was totally different and finally I just gave up and will keep this and order new sheets but won't buy them at overstock. Tired of shipping back and forth and paying shipping. Not worth the hassle. The picture on the site makes the quilt appear to be grey more than black like it is described. Happily it IS black and off white. The reverse side is black with mini dots or squares. The quilt is very generous in size and a nice weight for our hot Texas climate year round. We are very pleased with the look it gave to the bedroom and the quality of its construction. Fits nicely on our quenn size bed. We bought the drapes and valance to match added some white sheers and it turned out very pretty. We are very pleased with the product. As has been written before, this is not gray which I would have preferred but still love the black. It looks so fresh and clean and is wonderful with our black iron bed. I would not give it a 5 star as it is not as large (for a king) as I would want. Other than that I am satisfied with the quality and the beauty of it. I coordinated it with gray sheets and black pillow cases on 2 pillows and white pillow cases on 2 pillows. Stunning! I love this quilt for my king size bed. It is long enough to go over the sides of the bed, some king size bedding does not. I have 2 small dogs that sleep in bed and this does not show dog hair. I have washed this several times (monthly) and it is holding up so well, no fading or wear. I would buy this again. I'm very happy with this lovely quilt. I like the checkered design on the reverse side - it's a nice contrast, when turned back on the bed. The white of the background is a shade between ivory and white, but that works for me. The quality is great. Everyone loves it. Very nice quilt set, made well. Washed and dried still looks good. Good quality materials, love the look on my bed, looks delicate but still not to flowery for my husbands taste. Washes beautifully and gets softer with use. Perfect. Beautiful. So happy with this set. I love it, looks very nice with my black bedroom set. Very comfortable and just the right size, love this fabric it feels and looks very nice. Hi , Pls check my order and take a look on this photo , I really like my purchase and I have no problem to wait for my missing part , thanks. Love , love this guilt. The material looks great on my king bed!!! The color is true to picture and it lays perfectly. Size is true and again looks marvelous!!! Love the floral print on this quilt! It's more lightweight than a comforter but it was too pretty to pass up just because of that. I also purchased the euro shams to go with it and love them as well. This quilt is absolutely gorgeous! Bought the matching shams. would definitely buy again. "Do you not have the silver 5 piece bedspread in full or queen .it was 61.0"
Unfortunately no, the 5 pieces full/queen is not available at this time. "do you have a cranberry color in Amberley?" "Hello, Would you tell me what materials this is made from? Thank you, Paige"
"Is the pillow sham reversible? (does it have a different pattern on the back?)" There is a black and white pattern on the back side of sham that matches the reverse side of the quilt. Very happy with this purchase. Washes well and looks nice. The front side is the floral pattern and the back is the other. You can't reverse it unless you want to look at the openings for the pillow which are in the middle. The patten on back is mainly black with a white stripe design. Shams are not reversible. "Which pillow shams are included with the set?" It's floral pattern on the front, black-&-white geometric pattern on the back, just like the quilt. It's king-sized. Bought king size quilt, so came with King pillow shams. I have a deep mattress Quilt is a little over sized fit perfectly. Washed it no shrinkage. Very happy with this product. Pat R.
"Tell me how many day shipping from to day"
Our standard shipping to the US is 5 to 10 business days. It took 3 days for me to get the set. I absolutely love it. "Is it heavy or lightweight?" Hello Terri S., in my opinion this is heavy weight. Thank you for shopping with us!